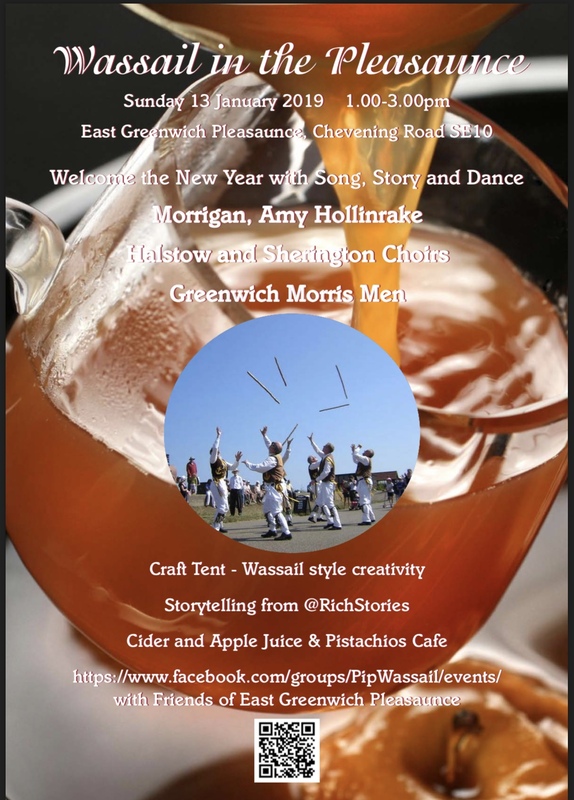 Dear friends and neighbours – I hope you can join us to welcome the New Year with a Wassail In the Pleasaunce. It’s on Sunday 13th Jan, 1-3pm, and we would be really grateful if you can spread the word! This is the fifth year the local community have come together for this traditional “New Year” celebration – with music dance and song. Wassailing also involves pouring an offering of cider on the trees of the community orchard. Cider and apple juice from London, and Kent apples will be on sale. RichStories will be telling some Wassail-style tales from local folklore. Alongside the café and playground of this well-used local park, amidst the roots of the old trees there are memorial stones and a mass grave dating from 1857 when the bodies of 3000 sailors from Greenwich Hospital were re-buried. The Wassail will naturally take a moment to remember them. Meet at Pistachios Café, East Greeenwich Pleasaunce, Chevening Road, London SE10 0LA. To find out more contact Rich Sylvester on 07833 538143.